Language is personal. Nothing gets closer to our hearts. And yet, by its own nature, it’s always social. Who owns it? Who appoints it? Who governs it? And why? In this one-woman show about the Scots language, Ishbel McFarlane presents collected fragments – stories, interviews, memories, characters and attitudes – to challenge and disrupt our expectations and prejudices about language. 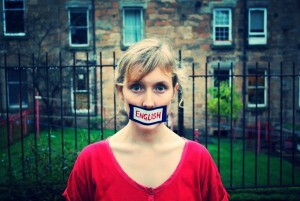 By interrogating the history of Scots, and the ways in which it is taught and subdued, the audience is invited to question the way forward for minority languages. Winner of The Arches Platform 18: New Directions Award 2014. We suggest an age suitability of 14+.